Would You Pay $350 For a Jean Jacket That Controls Your Phone? The future of fashion is here, for better or for worse. The list of things you can swipe right on grows longer every day. Now, your jean jacket is joining the club thanks to a collaboration between Google and Levi’s, as the The Verge’s Dieter Bohn writes. The two companies have teamed up to create a $350 jacket that can control your smartphone. Despite its name, the Commuter Trucker jacket is marketed to people who ride their bikes to work. (Or diehards of the wearable technology trend. Or both.) 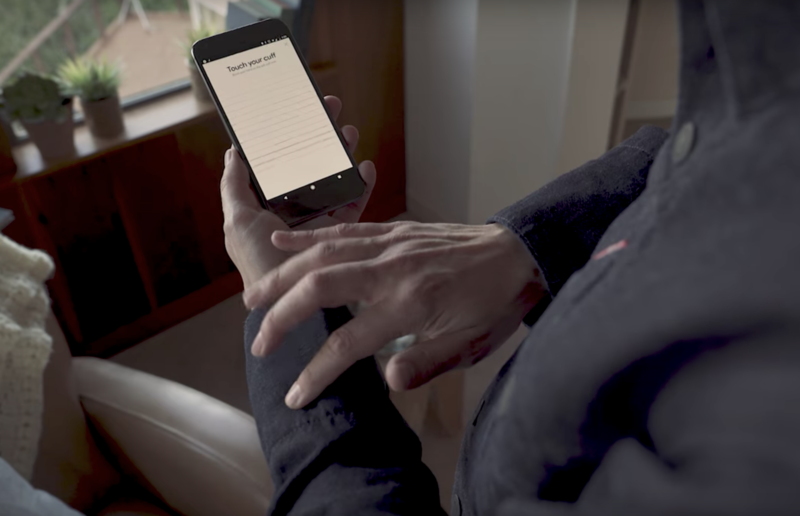 The jacket syncs to your smartphone and via some fancy threads, the sleeve becomes a veritable touch screen where you can tap or “brush” (which really is just a synonym for “swipe”) commands to your smartphone, like starting or stopping music. Think of it as a glorified Spotify pause button, but for a casual $350. That price tag—combined with the fact that the perks of this wearable tech demand you wear the same jean jacket through every season—make the Commuter Trucker jacket seem more like a short-lived novelty than the future of commuting. But there are undeniable safety perks, and the engineering behind the jacket is pretty fascinating. Bohn, who took the jacket for a test run, explains how the sleeve became touch sensitive via “capacitive threads with a copper core” sewn into the sleeve. That means it works similarly your other gadgets’ touchscreens. To make the jacket’s tech feature work, you attach a removable Bluetooth dongle to the cuff and sync the sleeve to your phone via app. (So yes, you can still put the jacket in the washing machine.) The app lets you decide what different motions (there are three to choose from—brush in, brush out or double tap) will communicate to your phone. For instance, you could program the brush in motion to skip a song or a double tap to start reading directions to you. There’s also a fourth gesture where you hold your hand on the fabric, which “is hard-coded to just shutting your phone up,” Bohn writes. Quieting your phone while riding your bike to work is a good idea. Plus, your synced smartphone can tell when you’ve put the jacket on, which puts your phone into a biking-specific mode, Bohn writes. Texts will be read aloud and you can choose who gets to call or text you, which makes it less likely you’ll need to look at your screen while navigating traffic. All in all, the jacket removes the apparently urgent need to check your phone whilst pedaling. (Which, for the record, you should never do.) But as Quartz points out, you could buy an Apple Watch that can do all of this and more for about the same price. And despite our love of uniform dressing, the watch wouldn’t require that you wear the same denim jacket every single day. I’m all for technology that makes it easy to stay connected without having a screen in your face, but it’s not hard to imagine the persistent hazards that might come with this jacket, like having to bike one-handed as you try to remember whether you programmed the tap or brush motion to stop playing your music. I think I’ll stick with my old-fashioned, unconnected outerwear. Read more on The Verge and Quartz.